Many single-family homes in Prospect-Lefferts Gardens have recently been sold to developers looking to build apartment buildings on the neighborhood's side streets. 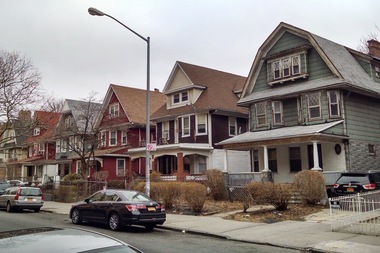 These homes on Fenimore Street between Flatbush and Bedford avenues are located inside the area's historic district and therefore, may have more protection from development. PROSPECT-LEFFERTS GARDENS — With the soaring demand for homes, a stalled plan to change land use rules in the neighborhood and a landmark district that only stretches so far, it's no surprise that even more single-family homes and residential lots are set to become apartment buildings in Prospect-Lefferts Gardens this year. DNAinfo New York found nine building projects currently under construction or set to begin soon in the neighborhood that will replace single-family homes and vacant lots on residential side streets with new apartment buildings between four and nine stories tall, building records show. The Department of Buildings approved plans in November for a four-story, 8,200-square-foot building with 10 residential units to be built by “Winthrop Heights LLC” on this property, formerly home to a two-story wood frame house, demolished this fall, according to building records and construction permits. The company bought the home from the previous owner in June 2015 for $1.04M, deeds show. ► 159 and 161 Winthrop St. The city approved plans in October from “Winthrop Partners LLC” for a four-story, eight-unit building to replace two homes, 159 and 161 Winthrop St., that have now been combined into one parcel, property records show. Work has already begun on the site, but the project was hit with a stop work order in early December, according to building records. The LLC bought 159 Winthrop St. for $1.325M in March of 2015; it’s unclear from the property deeds if that price included 161 Winthrop St., as well, or if that property was sold separately. A four-story, 8,300-square-foot apartment building with a penthouse on the top floor is set to replace what was once a single-family, two-story house that was demolished in 2011, construction documents show. The developer is Pinnacle Real Estate Ventures working through the company “Fenimore Realty Group LLC,” which bought the lot in 2009 for $205,000, deeds show. The DOB approved the development plans in December. A Hollis-based company, “4MB 320 Lincoln RD LLC,” submitted plans in October to build a five-story, eight-unit residential building on this vacant lot sandwiched between a detached house and a four-story apartment building on Lincoln Road between Rogers and Nostrand avenues, city records show. However, the project plans were rejected by the DOB in November. The LLC bought the property in July of 2015 for $550,000, deeds show. An application by “195 Hawthorne Partners LLC” for a 12,700-square-foot, five-story apartment building to be constructed on a vacant lot between a detached house and a brick apartment building was approved in late December by the city. The new building will have 10 apartments, the plans said. The real estate investment firm Atkins & Breskin is behind the LLC, which bought the property last year for $872,00, deeds show. Demolition was approved in November for a single-family detached house on this lot, to be replaced by a nine-story residential building with 16 units, according to building records submitted by “235 Hawthorne Street LLC” in October. The Department of Buildings rejected the plans in late December, though it’s unclear why. Zoning laws for the lot allow for up to 13 stories, depending on available open space. A deed from 2008 shows that the LLC bought the property from the previous owner for $0, though there is a $325,000 mortgage on the property from 2013. Demolition of a single-family home on this property was approved by the city in November, just before “244 Hawthorne LLC” filed plans to build a four-story, 4,600-square-foot building with seven residential units on the lot, records show. The plan was approved in late December. The company bought the property in October for $1.45 million from Gamoto Enterprises LLC, which in turn had purchased it in 2012 for $475,000 from the estate of the previous owner, deeds show. A barrel-fronted limestone townhouse is set to be replaced with a six-story, 8,000-square-foot building with 11 units, according to permits filed on Jan. 2 by owner David Shavolian working through Clarkson Ave LLC. The company bought the property in July of last year for $945,000 from the previous owner. The city approved plans in early December for a new seven-story, 20,000-square-foot residential building with 28 units to replace a red-and-white detached house the previous owner had obtained from HUD for $1 in 1975. The developer of the property, 650 Met Partners LLC, bought the house and lot for $1.125 million last June, deeds show.